I'm not going to say much more than needs to be said. I'm not going to rant about the inexcusable performance against Wigan on Monday. I'm not going to talk about Arsenal's tenuous hold on third place. All I'm going to say is that this is the most important game of the season. The most "must win" of all of the must win games they've already played. These three points matter more than any other three points they have picked up so far. Lose, and there might not be enough time left in the season to right the ship yet again. should just eat John Terry. Well, the bad news is Mikel Arteta's season is over. There is some good news in that his ankle is not broken, but there is ligament damage. The situation could be either about three months, like it was with Andre Santos earlier this year, or it could be longer, like it has been with Robin van Persie in the past. There will, of course, be talk of Arsenal's record without Arteta in the line-up, and let's face it, it's pretty bad in the league (it's one draw and four straight losses.) Don't forget, though, there were other circumstances plaguing Arsenal at those times: their general state of disaster before Arteta was purchased in August and their lack of a recognized fit fullback for the two losses in January. The question of who starts in place of Arteta is complicated by the fact that Yossi Benayoun is unavailable, unable to play against his parent club due to the terms of loan deals. Meanwhile, playing Abou Diaby would be a tremendous risk (and absurd, to boot,) even if he's been able to put in 45 minutes at the reserve level lately. That means you're left with selecting either the young and out-of-position Alex Oxlade-Chamberlain or the out-of-form and out-of-confidence Aaron Ramsey. And, to be honest, while the Ox had a great game in the middle against Milan, Arsenal had nothing to lose in that game, already down 4-0 in the tie. They had no choice but to go forward and attack. The pressure in this game is a totally different scenario, one for which I'm not yet convinced the Ox would be ready. You can't take a gamble like that in a game of this magnitude. I'd start the Ox on the left wing and play Ramsey back farther than he usually plays, with Tomas Rosicky playing in the distributor role. Of course, given the fact that Arsene Wenger has held off on using the Ox lately, likely in fear of overplaying him as was the case with Jack Wilshere, I wouldn't be shocked to see Gervinho start. At the back, Laurent Koscielny returns from his two match ban and Andre Santos will hope to keep his spot in the line-up after Kieran Gibbs returned to the bench on Monday. Predicted XI: Szczesny, Sagna, Vermaelen, Koscielny, Santos, Song, Ramsey, Rosicky, Gervinho, Walcott, van Persie. out with a hamstring injury. Arsenal's main hope is that Chelsea will be a bit knackered due to fixture congestion, as they played on Wednesday night after playing on Sunday night. The bad news for Arsenal, though, is both were huge spirit-lifting wins for Chelsea. The Blues have two problems in their back four, as clown college graduate David Luiz is out with a hamstring problem and Branislav Ivanovic serves the second of a three match ban. John Terry, meanwhile, has cracked ribs, but has been playing anyway. Ryan Bertrand (calf) and Oriol Romeu (illness) could possibly return. Arsenal have had another hiccup in form after losing to Wigan. This time, their league winning streak was only two before the loss, but Wigan was also the first side to win at the Emirates since Manchester United did in January. Across all competitions, Arsenal had won seven straight games at home. Arsenal have not lost two straight home games in the league since last November (Newcastle and Tottenham.) This November, they went two home matches without a win after a draw with Fulham and a Carling Cup loss to Manchester City. Prior to that, the last time Arsenal went more than one match without a win at home, they drew three straight last March/April. Chelsea, on the other hand, are flying high, though they have played a lot of games lately, so Gunners fans will be hoping that the fixture congestion catches up to them right about now. Andre Villas-Boas was sacked on March 4, after a loss at West Bromwich Albion. Since that date, Chelsea have won 10 matches, drawn two, and lost just once across all competitions. Their lone loss came at Manchester City on March 21. The draws came against Spurs and Fulham. Arsenal have been lucky to face Chelsea when they have been down on form in their last two meetings. That is not the case now. Arsenal have won their last two matches against Chelsea, which is a welcome change of the pace for the Gunners, who had lost five straight against the Blues before that. Arsenal won the reverse fixture 5-3 at Stamford Bridge the Saturday before Halloween. Robin van Persie had a hat trick, scoring the winner when John Terry fell to the ground in the 85th minute. Arsenal also had goals from Theo Walcott and Andre Santos. Chelsea had led 1-0 and 2-1 before Arsenal went ahead, then Juan Mata had leveled the score at 3-3 in the 80th before Terry's tumble. It's important to note that Didier Drogba was suspended for that match. Last year, Arsenal won this fixture 3-1 the day after Boxing Day. Arsenal took a three goal lead with goals from Alex Song, Cesc Fabregas, and Theo Walcott. Branislav Ivanovic pulled a goal back four minutes after Arsenal went up three to make things close again, but Chelsea could not come back any farther. Chelsea had won their previous two matches at the Emirates by astonishing three goal margins. Prior to these two Arsenal wins, Chelsea had won five straight over Arsenal, outscoring the Gunners 13-2 in that stretch. The last three matches of that run were clean sheet wins for the Blues in which Drogba had five goals. Drogba has 13 goals in his last 12 competitive matches against Arsenal, though he was held off the score sheet in this fixture last year. to tell Mike Dean that it was not a penalty for Spurs. Seriously? It's Mike Dean again? You have got to be kidding me. Prior to the QPR loss, Dean was in the middle for Arsenal's North London derby win over Tottenham in February, so hopefully that is more indicative of the luck Arsenal will have on Saturday. Then again, he did give Spurs a dubious penalty in that match. Prior to the derby win, Arsenal's form with Dean in the middle was: D-D-L-D-L-D-L-L-W-L-L-D-L, and that win was against Leeds. As for Chelsea's record with Mike Dean this year, he worked their 4-1 win over Swansea (in which Fernando Torres saw red,) the 1-0 win at Blackburn, the 3-0 win at Newcastle, the 1-0 FA Cup win at QPR, and most recently, the 2-1 loss at Manchester City. Arsenal v. Chelsea is the opening match of the weekend. After Arsenal played this past Monday, Spurs, Newcastle, and Chelsea all have a league game in hand, which will be made up on May 2. Spurs' game in hand is at Bolton; Newcastle's and Chelsea's match is against each other, at the Bridge. Speaking of Spurs, they play in the late game on Saturday, at Loftus Road against Queens Park Rangers, where Arsenal and Chelsea have already lost this season. Five matches will be played in the standard time slot. They are: Aston Villa v. Sunderland in Birmingham, Blackburn v. Norwich at Ewood Park, Bolton v. Swansea at the Reebok, Fulham v. Wigan at the Cottage, and Newcastle v. Stoke on Tyneside. 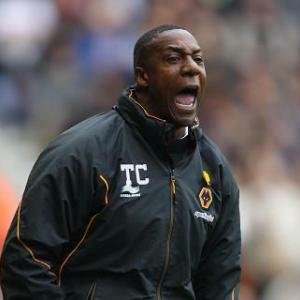 those who say Wolves are certain of relegation. Sunday's early game is at Old Trafford, as Manchester United hosts Everton. There are two late games, as Liverpool hosts West Brom at Anfield, and Wolves host Manchester City at Molineux. Wolves beat City at Molineux last year, but lost 5-2 to City in the Carling Cup at home in October. These are the reverse fixtures of those played the weekend of October 29-31. As for how the table looks right now, Manchester United holds a five point lead on Manchester City, with their final meeting of the season coming at Eastlands next Monday. Arsenal has a five point lead on Tottenham and Newcastle for third, but as stated before, have played one game extra. Chelsea has a game in hand as well, but they sit seven points out. There's a distinct set of teams now that we can call mid-table, in order: Everton, Liverpool, Sunderland, Fulham, Norwich, Swansea, West Brom, and Stoke. All eight are mathematically safe from the drop. Aston Villa has tumbled their way into the talk at the bottom, they are now only six points clear of the relegation zone, with 35 points. Wigan have risen their way to five points clear; they have 34. QPR are two points clear with 31. The bottom three are Bolton (29), Blackburn (29), and Wolves (23), but Bolton have two extra games to play.